The Liberty LE41A Sewage Pump comes with a 3-year manufacturer's warranty. These products can be used with the Liberty LE41A Sewage Pump. Heavy-duty built and reliable, Liberty's LE41A Sewage Pump is the perfect choice for residential sewage applications. Featuring all cast iron construction with an epoxy powder coat finish, stainless steel fasteners, quick-disconnect 10-foot power cord and a vortex style impeller for superior solids handling, the LE41A Sewage Pump combines solid performance with exceptional value. 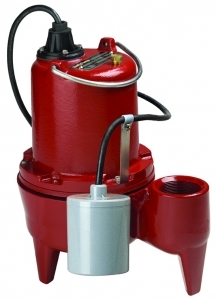 The LE41A Sewage Pump has 4/10 hp motor and a 10-foot quick-disconnect power cord, 2" discharge and 2" solids handling capability.